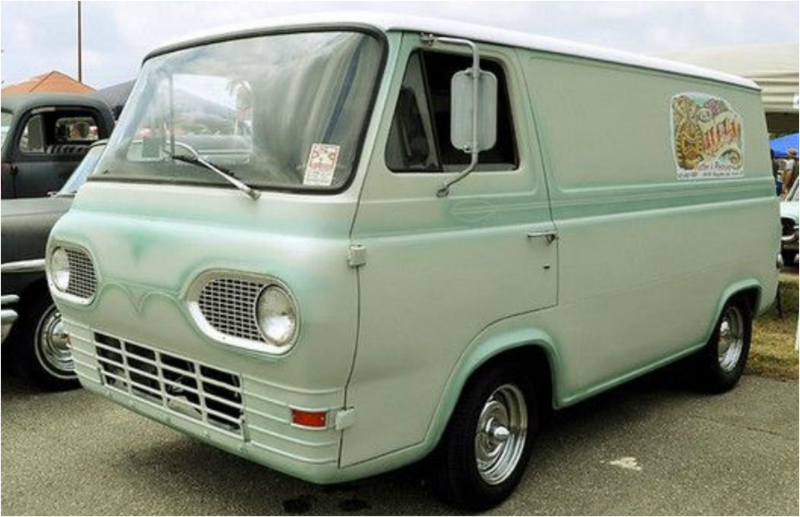 Many early vans came from the factories in exterior colors that were rather utilitarian, and were generally used as light-duty work vehicles. Which offered an opportunity to the recreational van owner. Bolder colors went a long way towards making a personal statement with these once-pedestrian workhorses. In some instances, their stock colors also took a whole different vibe once a set of well-proportioned wheels were screwed on. Classic flames in a vivid paint color on matte black with contrasting white wall tires and white grill lends a wicked look. The visor adds a nice custom touch. A vibrant two-tone color treatment with subtle graphics harkens back to the Pro Street vibe. Lowering and huge rear meats completes the ground-pounding look. 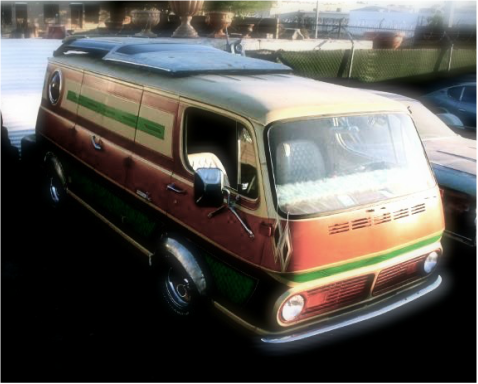 The Falcon Series of window vans came equipped with a unique wedge-shaped window and a handsome spear that ran along the van's flank. They didn't need much else. Simple and tasty. This long-wheelbase Chevy makes a bold graphic statement, along with blended real bumper and American Torq Thrust five-spoke wheels. 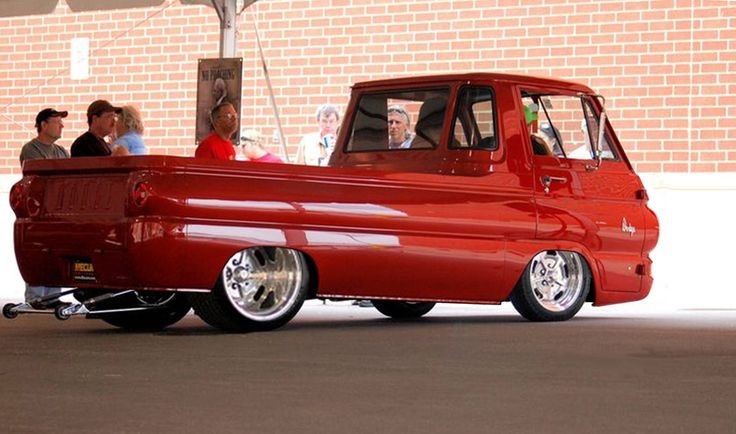 There's just something about red that looks fantastic against the Dodge A100 body style. This one has a heavily modified suspension and staggered wheel sizes to achieve its badass demeanor. What we we just saying about red is also demonstrated on this mildly customized A100. Careful wheel wheel and tire choice, and chrome bumpers and grill make a tasteful statement. Owned by long-time vanner and paint and body man, "Coop". 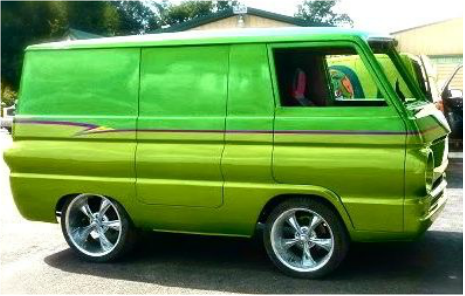 His recently completed A100 has been shortened by one cargo door and extensively shaved, then bathed in an eye-popping, two-tone green paint combo. Kerpow! We'll let the picture do the talking with this one. Painted factory steelies and a severe drop contribute to the unique statement. 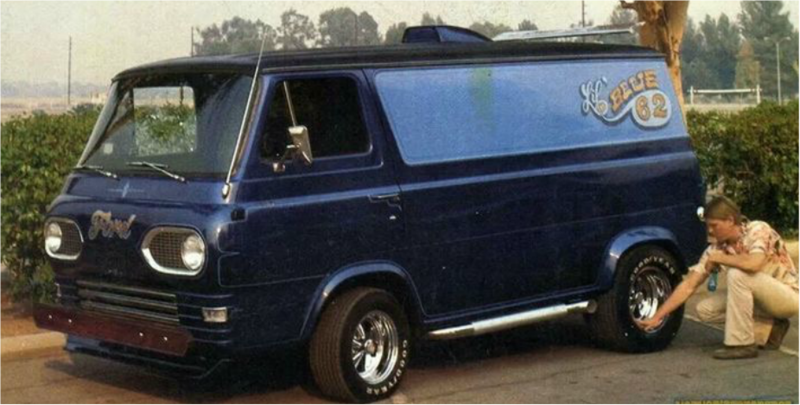 This first-gen Econoline has a little bit of everything going on. Flames, pin-striping, contrasting colored roof, custom five-spoke wheels and low-profile tires working in harmony to create a badass look. Although lesser-known than American Racing and Cragar wheels, Keystone five-spokes are a tasteful and period-appropriate. Other mods like a luggage rack, custom grill and painted bumpers conspire to create a tidy period custom. 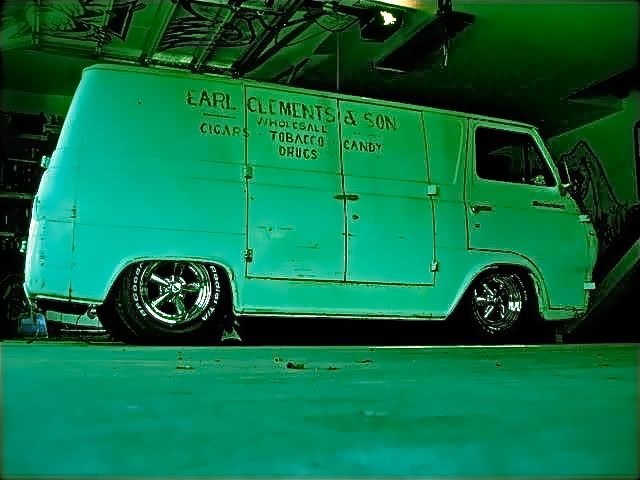 14" Cragar SS wheels and extensive lowering make this Econoline PU one of Vinvanco's favorite customs ever. We never tire of looking at this bad boy. Mothers, lock up your daughters. Just sayin'. With its custom wooden bumpers, gold leaf name, side pipes, chin spoiler, mild flares and a rear roof spoiler, along with an aggressive rake and wider rims, this Lil' Blue '62 has got it going on. A very nice example of a period custom. 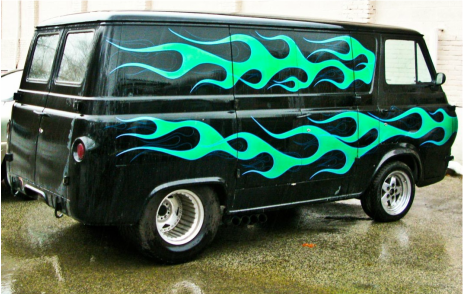 This tubbed Econoline is also rockin' a retro Pro Street attitude and if those rear tires are any indication, this van isn't about to back down from a fight. 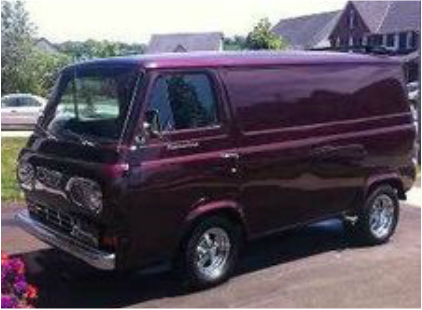 This is one if the Econolines that kicked the fully slammed Econoline movement into fast forward. Coby Gwertz, owner of Van Go, gleaned gleaned insight and inspiration from the builder of this van, which is now owned by the Harvey's Original Seat Belt Bag Company, and has painted graphics identifying it as such. 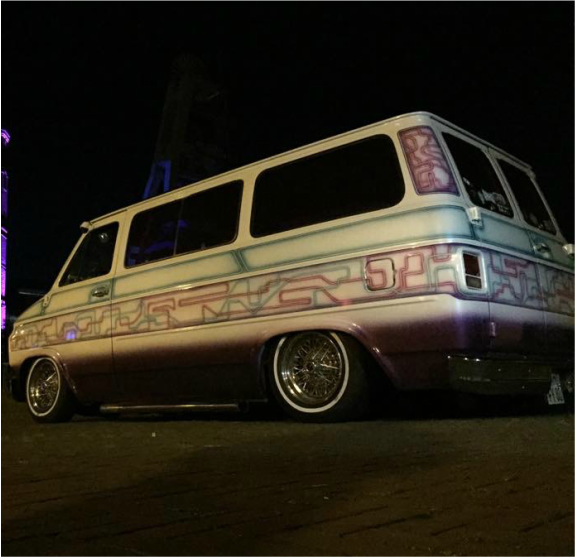 Built by Kleen Rock One of Chrome Gypsy Tattoo in Las Vegas, this ol' skool Econoline debuted at SEMA in 2014. It runs low-profile "pinner" white walls on 14" Cragars with custom-built side pipes. The interior is just as swank. You should see the man's tattoo work. 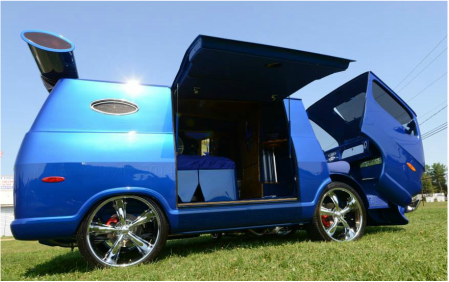 Probably the most well-documented custom Econoline on earth, Coby Gewertz's Van Go has crossed genres and earned mad props from all facets of the car community picking up ink and metal everywhere it goes. You can learn more about it on the Vinvanco blog. They don't come any cooler. 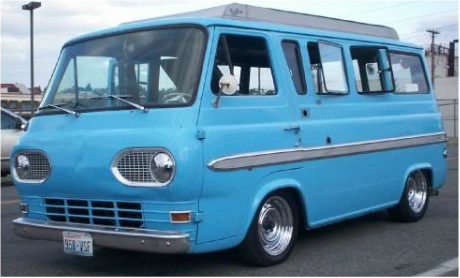 Period-perfect vanning at its finest. A great exterior color, Cragar SS wheels and a smattering of chrome. Restraint at its most magnificent. 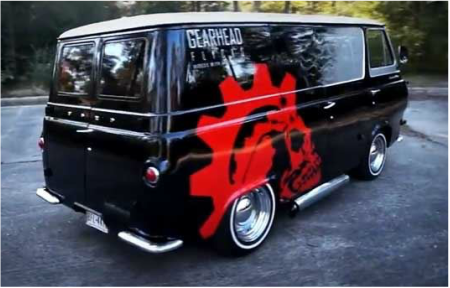 A rolling showroom for their video-production services, the Gearhead Flicks van is a fine example of judicious customization. Chrome factory-style wheels with baby moon caps are subtle and period correct, while its interior and exterior graphics do the talking. Bravo. Canadians could buy Econlines as Mercury's and this one is another fine example of how little is really needed when you've got a great custom color just the right add-ons. 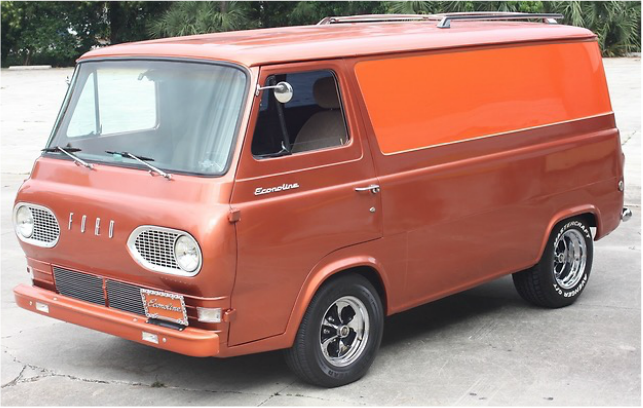 Despite a reputation that might suggest otherwise, photographer John Jackson's gorgeous Corvair van has logged more miles between photography assignments all around the United States than any other van we know of. We're talking hundreds of thousands of miles over the span of years. Originally painted a blue with fade paint and panel graphics, today John's van has a super tasty silver paint job with just as much custom love. 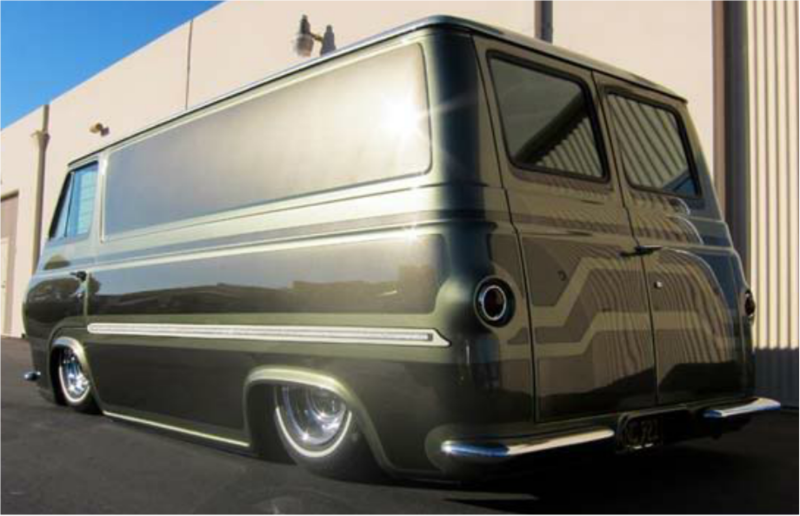 If you ever get the chance to see it in person, John has collected signatures of custom car builders and hot rod luminaries on the interior of his van, which is now in the process of receiving a highly modified, full-tilt custom, no holds-barred Corvair powerplant. We can't wait to see its future continue to unfold. Although the details we have on this van are limited, our sleuthing has ascertained that this van is a restoration, returned to the glory of it heyday. 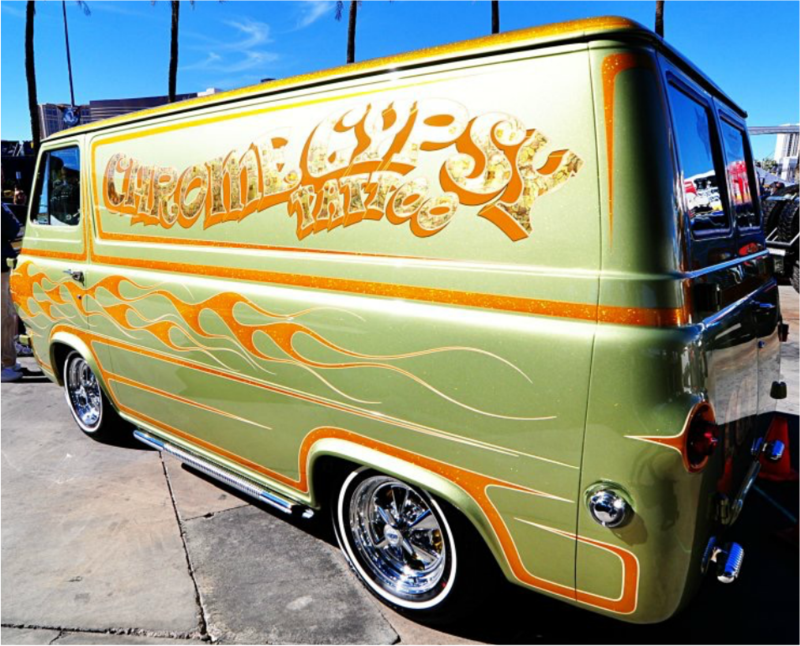 We have no idea whether the van's name has any correlation to the smiling blonde, but the van itself is every bit as striking as its friend, with a Vista Cruiser roof, wide flares, flames, hand-painted lettering, and big and little Cragar SS wheels. One way of ensuring a great looking outcome is to hire an automotive artist to provide concept sketches for your van in its build phase. 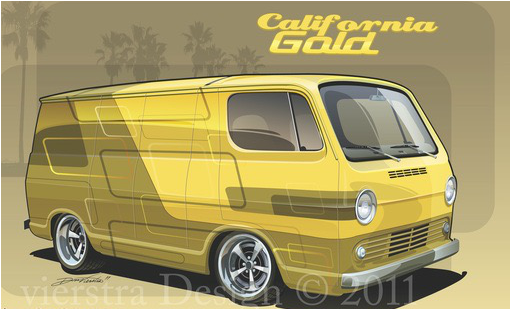 This Chevrolet van, called "California Gold" features repeating geographic shapes in complimentary colors and was penned by automotive artist, Don Viestra. We dig it. 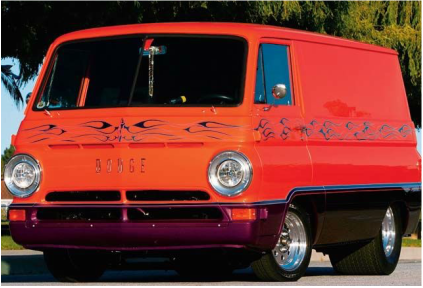 Having spoken briefly to this van's owner when it was for sale, this Dodge was equipped with a big block Chrysler engine, making it every bit as muscular as its paint job implies. Well done. Smoke 'em if you got it. And this one does. 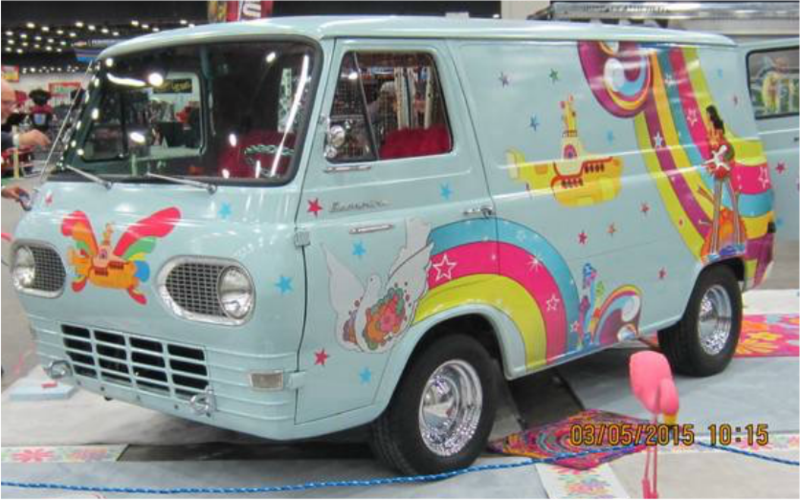 Although less common among customizers, this long wheel-base Chevrolet van proves that a little imagination goes a long way. Metal fender flares, a Vista Cruiser roof, and a porthole, make this wildly painted cruiser a rolling billboard for bling. It has since been painted metallic gold and goes by the name "Balls Deep". We'll leave it at that. 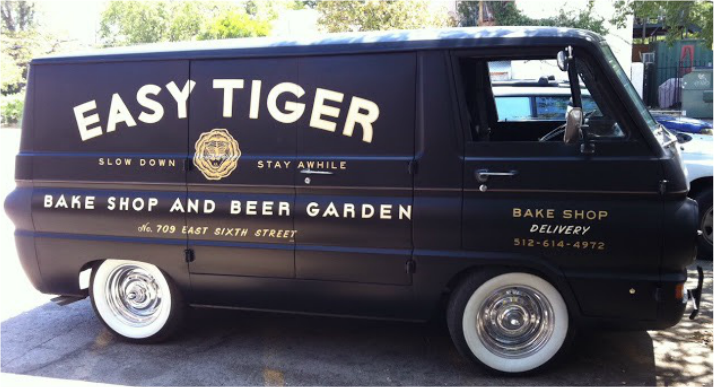 Like Vinvanco itself, this well-dressed Dodge calls Austin, Texas home and is regularly seen around town, advertising East Tiger Bake Shop and Beer Garden. The typography on this van is epic. This unusual paint job was inspired by Mexican folk art and definitely makes a unique statement. Imagination is the only limitation. Its ride height suggests that it has been built upon a 4X4 platform, we're guessing a Chevy Blazer. 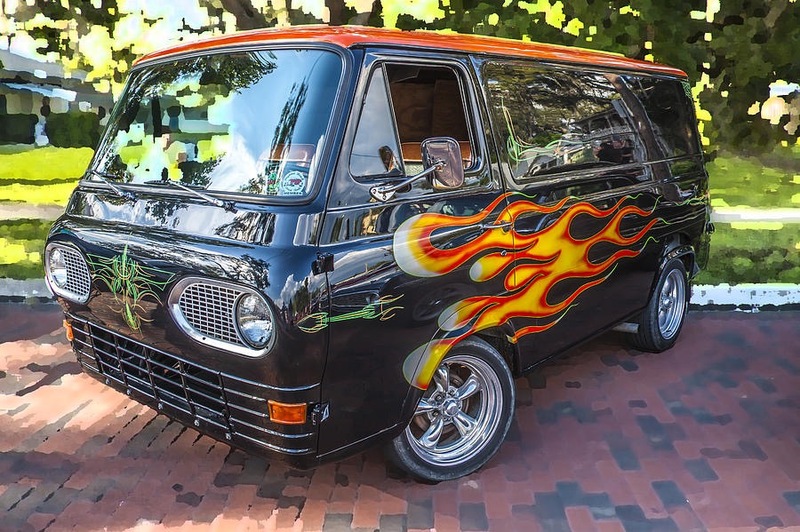 Built in Japan, this third-generation Chevy van pays homage to low-riding with an intoxicating mix of panel painting,airbrushing and wire wheels with skinny whitewall tires. Viva la difference. 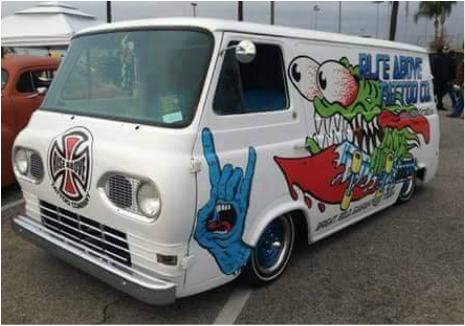 This radical van features a tilt front clip with sealed doors, a gull wing cargo door and lord knows how many other one-of-a-kind features. The wheels and tires are huge and we imagine the list of mods would be just as humongous. 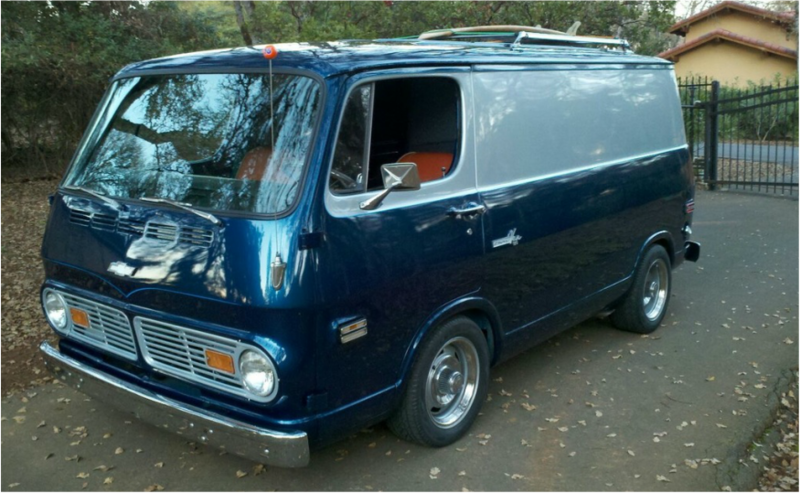 This stock second-generation Chevrolet proves how little a van really needs to be a sweet period correct cruiser. 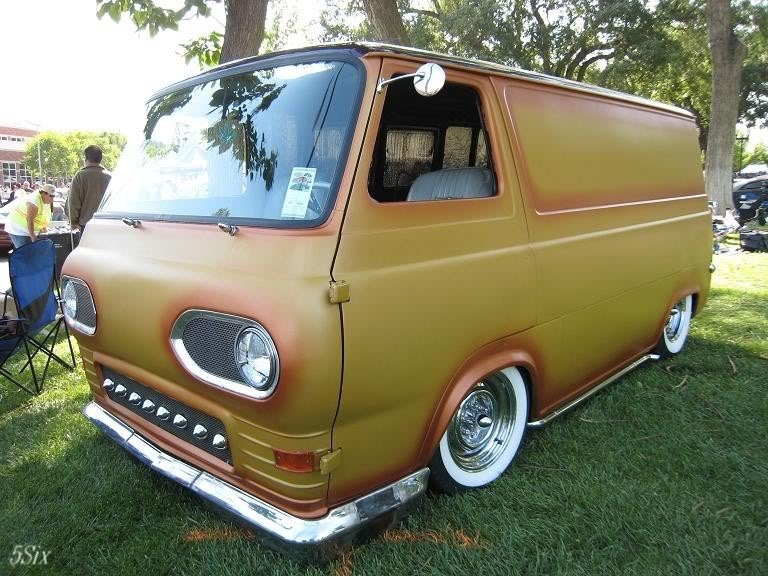 A clean body, two-tone paint and factory rally wheels make this van seem like it could have rolled right out of the factory this way. Bravo. 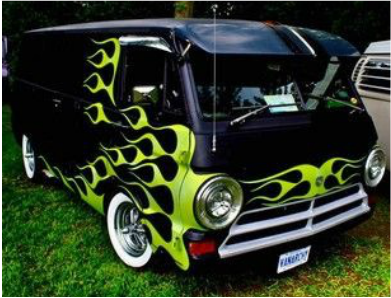 Once owned by tattoo artist Dart Daugherty, this Econoline is another fine exmplae of a little going a long way. Subtle fade graphics over an understated pastel color makes for a clean custom. 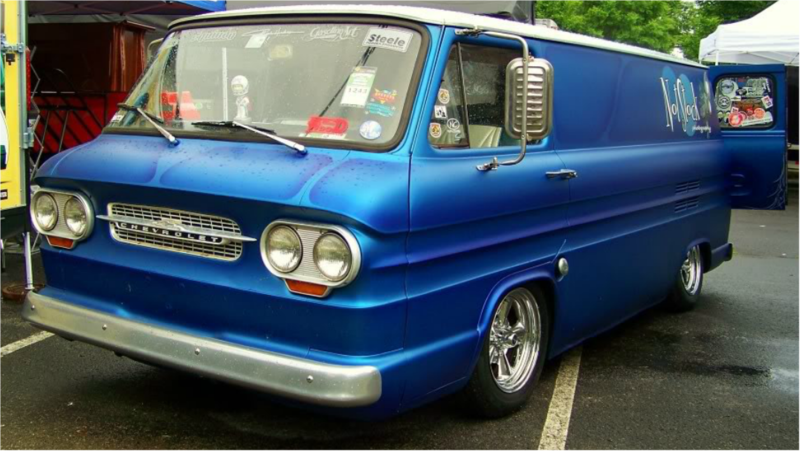 Known as Bosko, this Austin, Texas built van has since relocated elsewhere, as has its owner. We miss seeing them both. 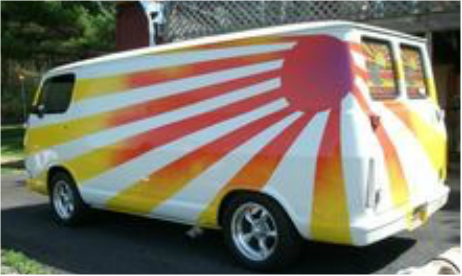 This van's owner chose to use vinyl graphics to create this Yellow Submarine/ Peter Max influenced van. We received a note explaining that is has been returned to its simple base color and given a period-correct Aluminum slot wheels and a nice rake. 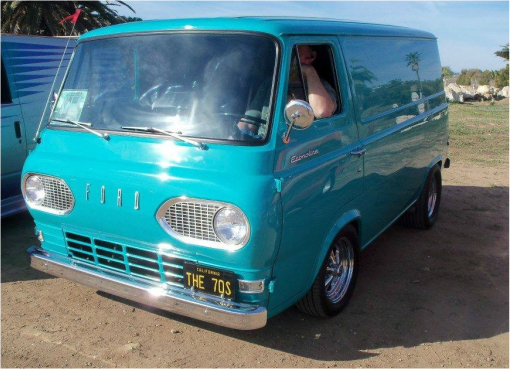 Donn Dabney of Sonoma, California has built this beautiful Econoline as a tribute to surf vehicles of the sixties and seventies. 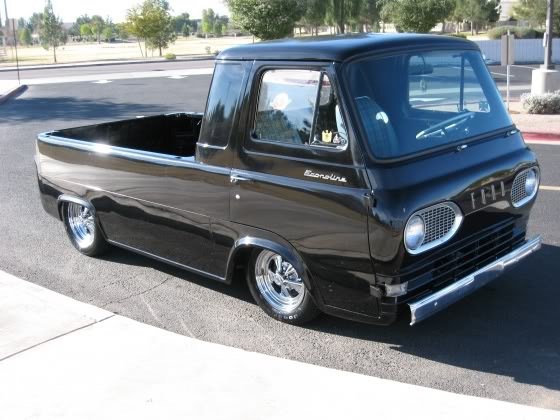 Donn has spared no expense to make this Econoline a stunning example and continues to make very tasteful improvements to what is already a phenomenal ride. This is Poochie, which is slotted to one day become the Vinvanco merch vehicle. It was a one-owner garage find, and is named after its first owner who used it for over twenty years before retiring it to a garage where it sat untouched for well over two decades. We have no intention of changing its bruised and dimpled exterior, but do plan an extensive refresh of its drive train and suspension. it patiently awaits it moment to shine.